According to avid kayak angler Paul Davis, the striper fishing on the Congaree River is heating up. This is urban fishing in its purest sense, with the Jordan Memorial Boat Landing immediately behind the Budweiser plant in downtown Columbia. 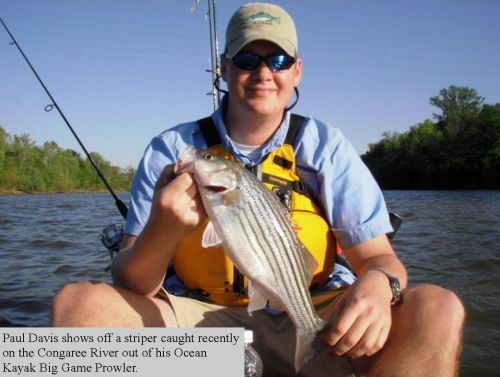 On a recent outing, Davis caught several stripers on the Congaree, with the bite really turning on around 4 p.m.
Davis reports he didn�t catch any big fish, but that when you�re in a kayak and using light tackle, it�s just as much fun to catch those smaller fighters. His lure of choice for the day was a silver Smithwick Rattlin� Rouge, and he also had luck with a jointed jerk bait. Davis fishes out of an Ocean Kayak Prowler Big Game Angler kayak, and is known by the handle tallpaul0579 on the sckayakfishing.com website. sckayakfishing.com is the premier kayak fishing forum for the Palmetto State and is made up of anglers across the state sharing information on kayak rigging, fishing locations, and much more. Stop in today at www.sckayakfishing.com.